Sitting in a reclined position when the vehicle is in motion can be dangerous. Even when buckled up, the protection of your restraint system (seat belts and air bags) is greatly reduced by reclining your seatback. NEVER ride with a reclined seatback when the vehicle is moving. Riding with a reclined seatback increases your chance of serious or fatal injuries in the event of a collision or sudden stop. Drivers and passengers should ALWAYS sit well back in their seats, properly belted, and with the seatbacks upright. Seat belts must be snug against your hips and chest to work properly. 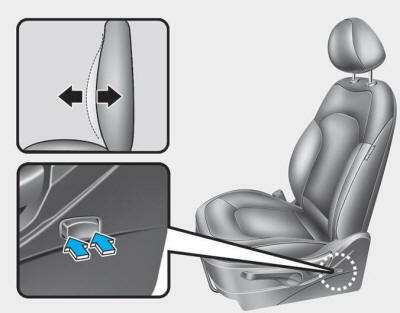 When the seatback is reclined, the shoulder belt cannot do its job because it will not be snug against your chest. Instead, it will be in front of you. During an accident, you could be thrown into the seat belt, causing neck or other injuries. 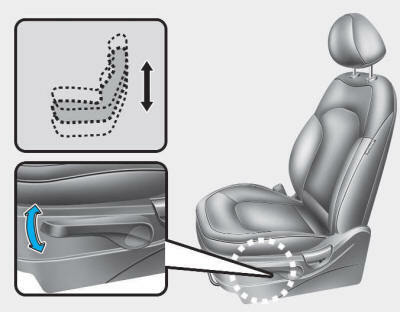 The more the seatback is reclined, the greater chance the passenger’s hips will slide under the lap belt or the passenger’s neck will strike the shoulder belt. Push down on the lever several times, to lower the seat cushion. Pull up on the lever several times, to raise the seat cushion. 1. Press the front portion of the switch to increase support, or the rear portion of the switch to decrease support.